Blessed Solanus Casey is known as a miracle worker. One story that I came across happened to feature ice cream. Considering that there is this miraculous story involving ice cream, this frozen treat seems a proper dessert option on his midsummer feast day today. I decided to top it with a honey caramel sauce because he took care of the beehives at the monastery and was known to soothe the bees with his harmonica playing. One hot summer day, Blessed Solanus had seen many people at the door seeking his blessing and counsel. One visitor had come to thank him for his help in one manner or another, bringing ice cream cones to celebrate. 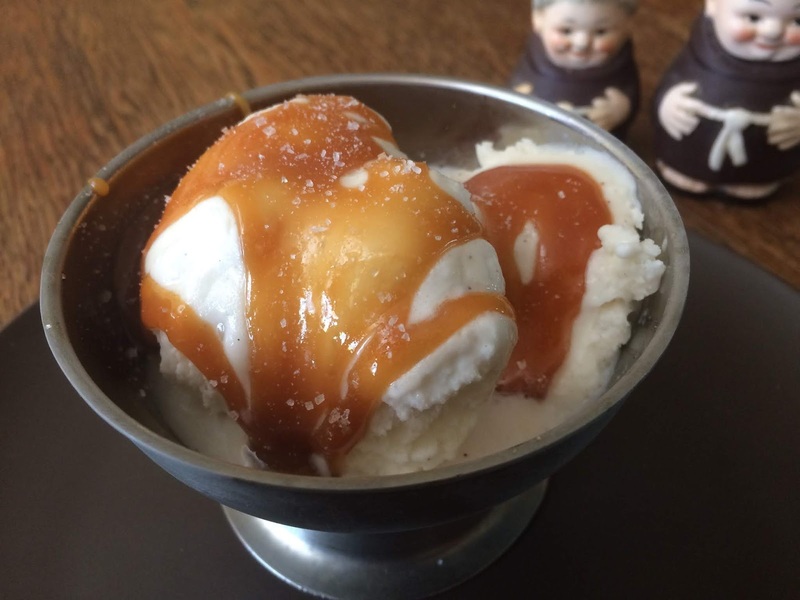 Called to another situation, Blessed Solanus sat the ice cream in his desk drawer. About 30 minutes later, one of the friars returned to the monastery from the dentist’s office. He had gone to arrange an operation to take care of a serious infection of his jaw. Before he left, he sought Blessed Solanus’ blessing, which he received. Blessed Solanus did not believe that religious should normally ask for miracles because they should embrace the sufferings God placed before them. But, as the custom of the day dictated, such a major health complication for a novice likely would mean they would have to leave the order. Blessed Solanus took pity on this friar, and in giving his blessing indicated the dentist might be surprised. Sure enough, the infection was gone. Combine sugar, honey, and water in a medium saucepan. Heat over medium, stirring until sugar dissolves. Bring to a boil; cook until mixture is golden brown and smooth in texture, additional 4-6 minutes. Remove from heat and carefully whisk in cream, butter, and salt (be careful, mixture will splatter). Let cool. Spoon over ice cream and serve. Sprinkle with additional sea salt if desired. Sauce can be refrigerated for up to two weeks. Reheat before serving.